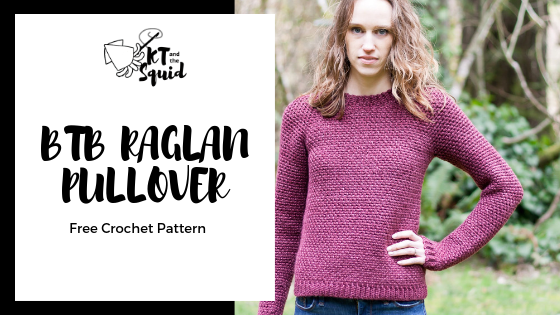 The BTB Raglan Pullover is the first of my Back to Basic free crochet pattern series! This series will feature basic crochet sweaters that use the same yarn and stitches but different construction techniques. Stay tuned for more information about this series! Use #BTBcrochet and tag me @ktandthesquid when sharing on social media! The sample is shown in size XS on a model with a 32” bust. If you are left handed, you will have to reverse the direction instructions. Repeat row 2 until you have 68 (68, 68, 80, 92, 92) rows. Slip st the first row to the last row. Work in the back loop of the last row to keep the ribbing consistent. You will now start working in the sides of the neck trim rows. Note: the sc will be worked in the ch-1 space (as with the gauge) from here on. Move each st marker to the corresponding ch-1 space after every row/round of the yoke. Fasten off, turn, join to the 2nd marked st. This 1st round will be worked in the sts of the last round and the unworked sts of the set up round. Repeat round 9 (9, 9, 10, 11, 11) until you have 24 (28, 32, 34, 36, 42) total rows/rounds including the set up round and neck shaping rows. Each repeat of the last round will add 8 sts, you will end with 252 (284, 316, 344, 372, 420) sts. Repeat rows 2 and 3 around the bottom, slip st the first row to the last row making sure the seam is on the same side as the neck trim. Join to the 1st chain of the underarm. Round 2: Ch 1, turn, sc in the next st, ch 1, skip 1; repeat from * around, join with a slip st to the 1st st.
Repeat round 2 adding decrease rounds as listed below until you have 66 rounds. You will end with 34 (42, 44, 46, 46, 50) sts.